The solution was a complete package of improvements which could be easily mounted on the T-62 tank. Called ??? (which expanded to Bezopastnost’ Drozhogo Dvizheniya or Road Movement Security) the package both upgraded the T-62's combat capabilities as well as vastly improve its protection against RPGs and mines. This included: a passive armor array on the glacis; passive armor arrays on the turret cheeks, nicknamed “Ilich’s Eyebrows” after Brezhnev; a passive armor array on the belly extending back to the second road wheel station; a suspended driver’s seat to keep him from directly absorbing mine blasts; steel mesh reinforced side skirts; and “Tucha” smoke projectors. Offensively the tank also received a laser rangefinder over the main gun. 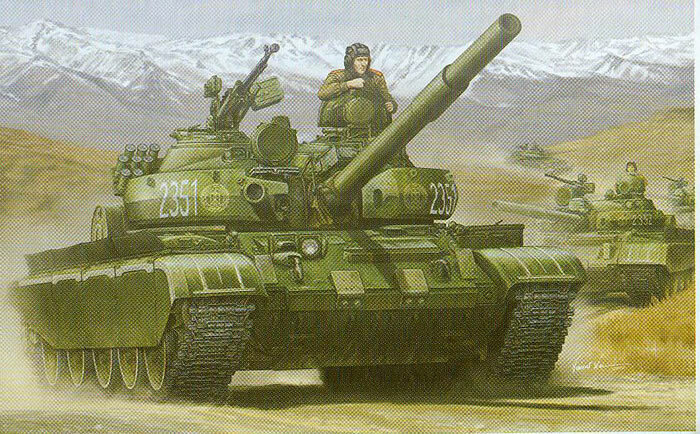 While this option has been available as an after market kit for some years (as well as being part of the similar upgrade that yielded the T-55AM2 series tanks) this is the first time it has been offered as a complete model kit.